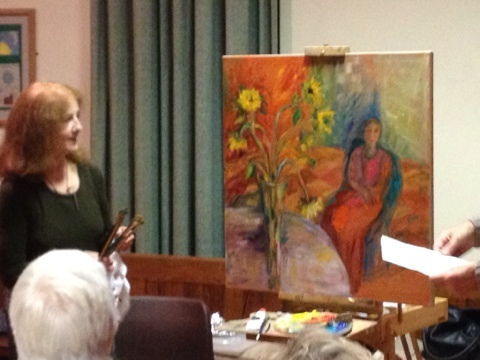 Last night I went to a painting demo at Clevedon Art Club from Glo Williams (rwa page) last night. She’s a fine example of working in your own way, she had a very small sketch and 3 sad looking sunflowers and produced this lovely piece. She loses interest in working for more than one day on a piece but did recently finish at 4 am. She reckoned it was worth it. She said she would finish this demo off tomorrow though and I hope she remembers to circulate the finished product.